A team of astronomers from the National Astronomical Observatory of Japan (NAOJ), the Konan University and the University of Hyogo in Japan, the University of Notre Dame, and New Mexico State University (Note 1) has used the 8.2 m Subaru Telescope’s High Dispersion Spectrograph (HDS) to discover a low-mass star, SDSS J0018-0939 (Fig. 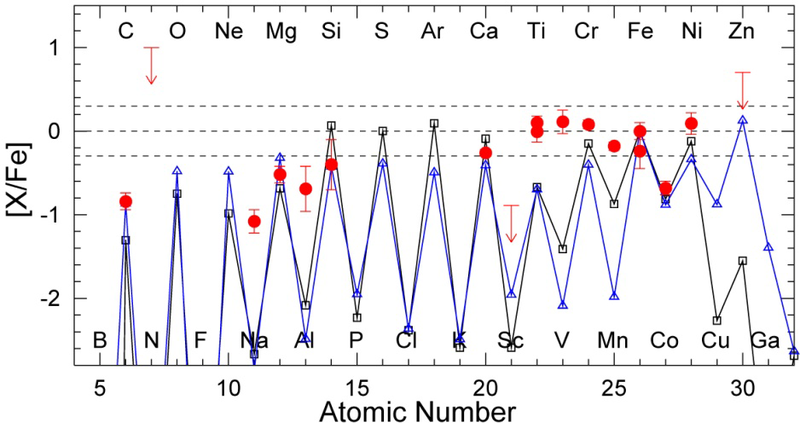 1), that exhibits the peculiar chemical abundance ratios associated with the process of creating new atomic nuclei (nucleosynthesis) in a first-generation very-massive star. Until now, no observational evidence has supported numerical simulations of the existence of very-massive stars among the first generation of stars formed after the Big Bang. 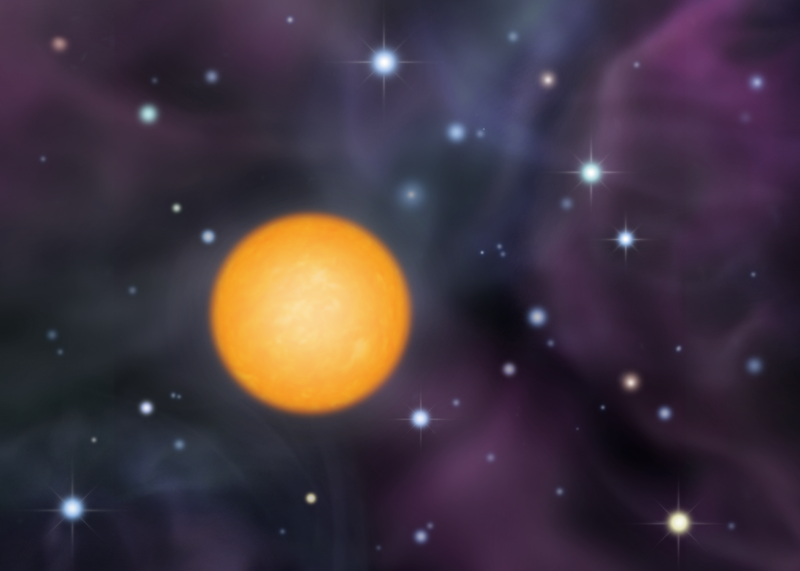 First-generation stars are objects formed in the early Universe (within a few hundred million years after the Big Bang) from gas clouds containing only hydrogen and helium (Fig. 4). First-generation stars are the probable precursors of the formation of the Universe’s structure and chemical enrichment; large stellar systems, e.g., galaxies, formed later. 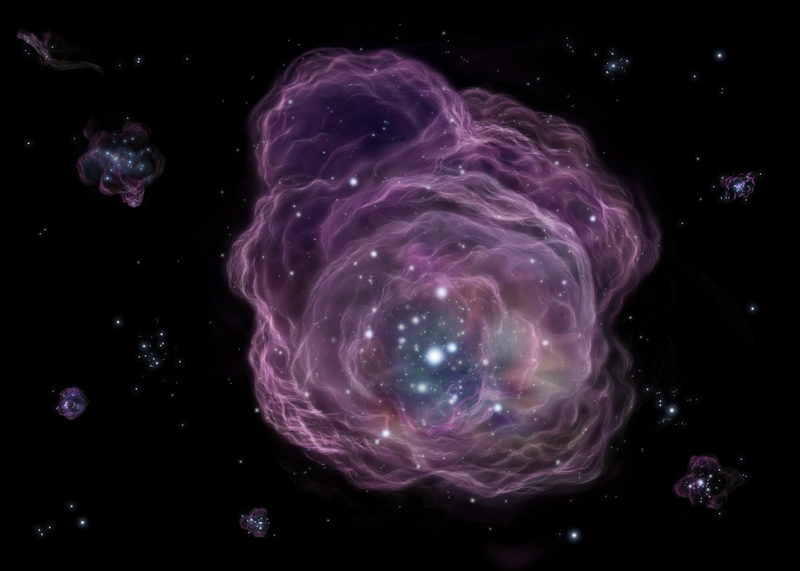 Numerical simulations have made significant progress in understanding the formation of the first stars (Note 2). Recent simulations suggest that a small fraction of very-massive stars with masses exceeding one hundred times that of the Sun could have formed in the early Universe, even though the large majority of first stars formed with masses of ten to a hundred times that of the Sun. Their strong UV radiation and energetic explosions are likely to have had a significant impact on the evolution of stellar systems. Supernova explosions ejected elements formed by the first massive stars and dispersed them into the gas that formed the next generations of stars (Fig. 5). Stars with masses slightly less than the Sun’s have very long lifetimes, long enough that they are still shining. The Milky Way contains such low-mass stars with low overall metal content, including the elements produced by the first massive stars. The distinctive chemical abundance patterns of these stars can be used to estimate the masses of the first stars. Over the past thirty years astronomers have conducted large-scale investigations to find low-mass, metal-poor stars formed in the early Universe. 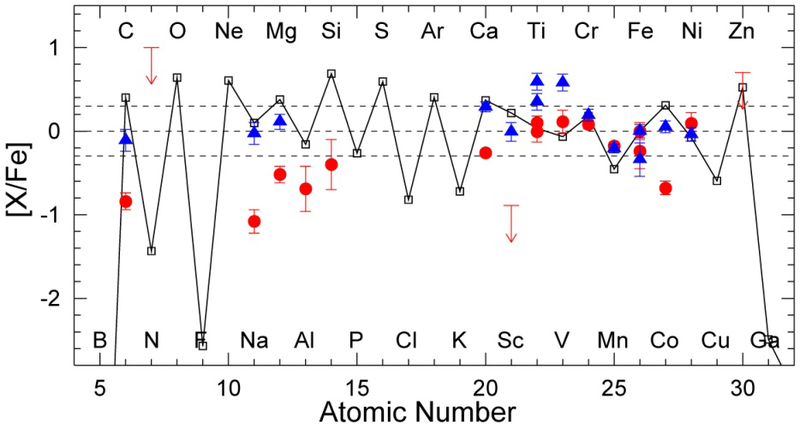 Follow-up spectroscopic studies, which measured their chemical abundances, have identified stars that recorded the abundance patterns associated with the first stars that had several tens of solar masses and produced large amounts of carbon and other light elements (Note 3). However, no previous research of low-mass metal-poor Milky-Way stars has found the signature of supernova explosions of very-massive stars with more than 100 solar masses, which synthesize large amounts of iron but little carbon (Note 4). The current team of researchers used the High Dispersion Spectrograph mounted on the Subaru Telescope to conduct a high-resolution spectroscopic follow-up of a large sample of low-mass metal-poor stars (Note 5, Fig. 1) and discovered a star, SDSS001820.5-093939.2 (SDSS J0018-0939), that exhibits a very peculiar set of chemical abundance ratios. Whereas the star contains an amount of iron 300 times lower than the Sun’s, it is significantly deficient in lighter elements such as carbon and magnesium. 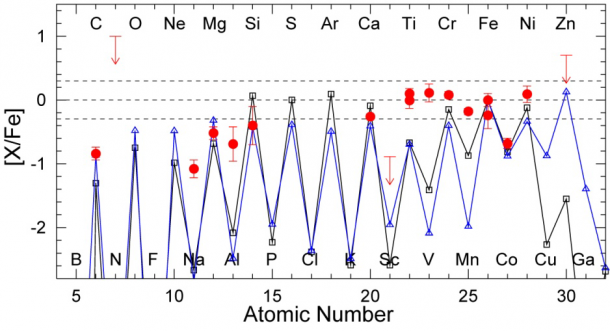 The extremely low abundances of elements other than iron indicates that this star formed directly from a hydrogen gas cloud that contained elements dispersed by a first-generation massive star. Nucleosynthesis models for supernova explosions of massive stars, which successfully reproduce the abundance ratios found in most of the early-generation stars previously known (Fig. 2) do not readily explain the chemical abundance ratios observed in the newly discovered star. Rather, explosion models of very-massive stars can explain both the relatively high abundance ratio of iron as well as the low abundances of lighter elements (Fig. 3). This means that this star most likely preserves the elemental abundance ratios produced by a first-generation very-massive star. The discovery of a star that could have recorded the chemical yields of a first- generation very-massive star will stimulate further modeling of the evolution of very-massive stars and the nucleosynthesis processes that occurred during their explosions. 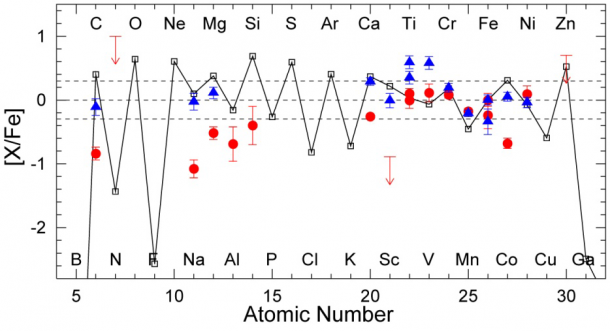 If more detailed modeling of the elemental abundance patterns in this star confirms the existence of very-massive stars, this new discovery will help to focus our understanding of the formation of the first stars and the birth of the elements. The strong UV radiation, energetic explosions, and production of heavy elements from very-massive stars influence subsequent star as well as galaxy formation. If stars with masses up to 1000 solar masses existed, their remnants are probably black holes with several hundred solar masses, which may have formed the “seeds” of super-massive black holes, such as found in the Galactic Center. Further research to find early generations of low-mass metal-poor stars is necessary to estimate the proportion of very-massive stars among the first stars. If very-massive stars are relatively common, next-generation large telescopes such as the Thirty Meter Telescope (TMT) and the James Webb Space Telescope (JWST) will have the potential to directly detect groups of such first stars in studies of the most distant galaxies (Note 6). The research paper on which this release was based, “A chemical signature of first-generation very-massive stars” by W. Aoki, N. Tominaga, T. C. Beers, S. Honda, Y. S. Lee, is published in Science on August 22, 2014. Grant PHY 08-22648: Physics Frontiers Center/Joint Institute for Nuclear Astrophysics (JINA), awarded by the U.S. National Science Foundation. 2. Numerical simulations usually start with considering initial non-uniform distributions (i.e., inhomogeneities) in the dark matter density of small regions formed after the Big Bang. The larger gravitational forces associated with a high-density region gathers normal (i.e., baryonic) matter, such as primordial gas, and the density of the region increases. First stars probably formed in such regions. 3. A massive star ends its life by collapse of its central core and a supernova explosion, leaving behind a black hole or a neutron star. The explosion ejects a certain amount of heavy elements, from carbon to iron. Previous observations of early-generation low-mass stars have identified stars exhibiting elements produced by such supernovae. 4. The central temperature of evolved very-massive stars becomes so high that electron-positron pair-creation occurs, resulting in the collapse of the central core, and a nuclear reaction runaway that explodes the star. If the star is more massive than about 300 solar masses, the explosive nuclear reaction is insufficient to prevent the core from collapsing, resulting in the direct formation of a black hole, but some fraction of the material might have still been ejected. 5. The team conducted chemical abundance measurements based on data obtained with the Subaru Telescope High Dispersion Spectrograph (HDS) for early generations of stars found by the SDSS. SDSS J001820.5-093939.2 (SDSS J0018-0939) is a star showing peculiar abundance ratios among 150 stars studied with the Subaru Telescope. The team used the same instrument to make a more detailed measurement. 6. 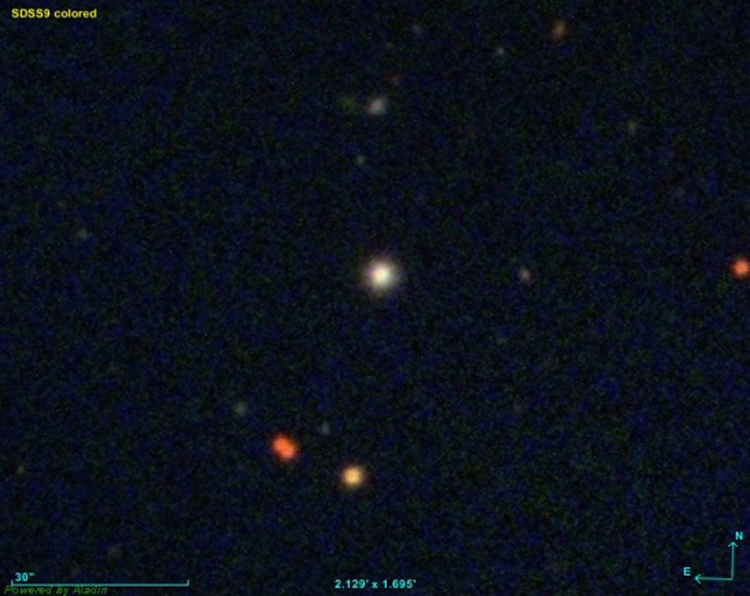 Observations of more distant objects allow scientists to study earlier eras of the Universe. Although the next generations of large telescopes may not even be able to distinguish individual first stars, they should be able to observe groups of such stars, if very-massive stars indeed existed.